Regular readers will be aware of the praise we have heaped upon the Media History Digital Library, the initiative of David Pierce to provide access to digitised film trade journals for free to all via the Internet Archive. You may know that we are listing all of the titles made available through this source and others in the Journals section of the Bioscope, arranged by country. We now want to draw your attention to just one such journal, because its (currently) unique nature raises a vital issue. Pierce has recently digitised a volume of The Optical Lantern and Cinematograph Journal, covering November 1904 to October 1905. This is an exciting development because it is the first British film trade journal to be made available in digitised form on the Web. But why has British silent cinema studies fared so badly, when there are now extensive film journals from America, France, Italy and others now available online? Founded as The Optical Magic Lantern Journal in 1889, the journal changed its name to The Optical Lantern and Cinematograph Journal in 1904 in response to a changing industry, as many lantern operators and photographers moved across to the new medium. The publisher was E.T. Heron, the editor Theodore Brown. 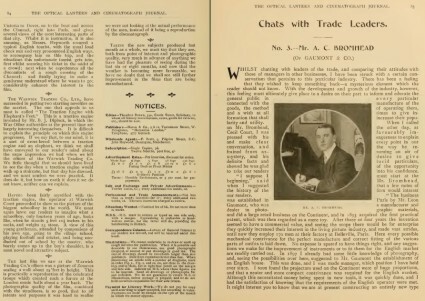 Published monthly, the journal included notices of new films, news, issues of the day, information on new patents, interviews (Charles Urban, James White, A.C. Bromhead), advice columns, correspondence, and information on magic lantern practice as well, providing a fascinating picture of an industry in transition. Though this is a highly welcome offering, it does highlight the sad fact that it is currently the only historical British film journal available online. Two theatre-based journals with plenty of information on silent films, The Era (up to 1900 only) and The Stage, are available online, though both require a subscription. A project from a few years ago by the University of East Anglia to tackle The Kinematograph and Lantern Weekly (the journal which succeeded The Optical Lantern and Cinematograph Journal in 1907) was a disappointing flop, with no digitised pages, only a very incomplete index for the 1890s, early 1915, 1943-mid-1954 and 1955-1971. And that’s it. There were three main film trade journals in Britain for the silent era: The Bioscope, The Cinema and The Kinematograph Weekly, while Picturegoer was the main fan jounal. There were many other journals of abiding interest- the British Library provides a listing of the British and Irish film journals that it holds, which is eye-opening in its great variety. Titles include The Film Censor, The Film Renter, The Irish Limelight, The Picture Palace News, and Rinking World and Picture Theatre News (roller skating rinks and cinemas were closely allied around 1909-10, as many rinks were converted into cinemas). Other countries have done so much better. Either through private enterprise, or through the dedicated endeavours of film institutes or national libraries, a good selection of film journals for the silent era is now available from Italy (the leader, thanks to the remarkable efforts of the Museo Nazionale del Cinema), France (courtesy of the national library’s Gallica website), USA (private enterprise and the Internet Archive) and Brazil (courtesy of the Biblioteca Digital das Artes do Espetaculo), with one-offs from Austria, Sweden, Spain and others. The reason the UK has done so badly so far is partly down to no money, and partly down to copyright laws which effectively put the 20th century out of bounds for the time being (the British Library, for example, has made the decision that it will only digitise from its newspaper and journal collections up to 1900, to be on the safe side). 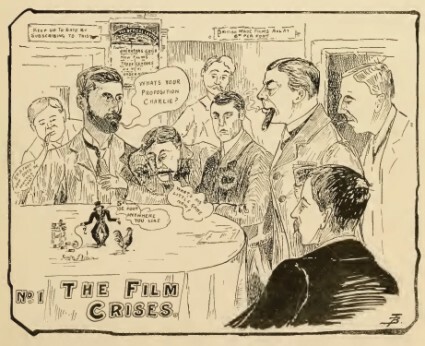 There are research council funds available for an academic able to put together a persuasive bid, but there has been no success there as yet bar the Kinematograph Weekly project which – it has to be said – did things so badly that it may have queered the pitch for any other project hoping to digitise film journals. The UK is not the only country with such a poor record (Germany, anyone? ), but the lack of enterprise shown so far is profoundly disappointing. So, as things stands, we have one year of one journal, and that made available through the Internet Archive. How are we going to do better that this? (and thank you to Arndt Pawelczik for letting me know).